I was Googling around the other day and came across the State Historical Society of Missouri website. 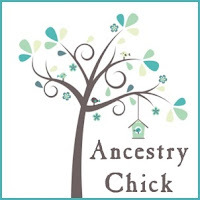 I'm sure I've been on that site before because I have many ancestors from Missouri, but I guess it's been awhile. 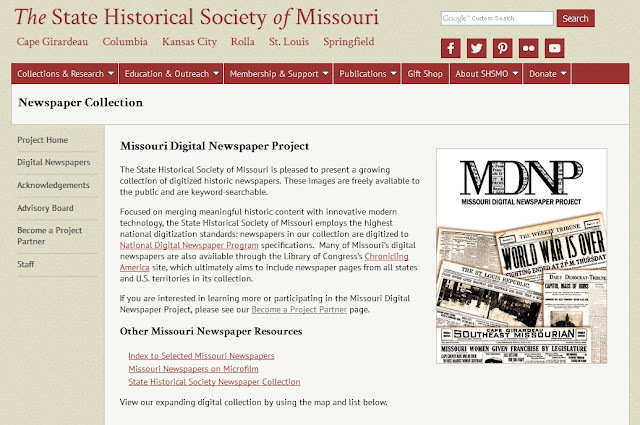 They have many wonderful resources, but one that I particularly like is their Missouri Digital Newspaper Project. It is a digital collection of their historic newspapers, and they are freely searchable to the public. Many of their newspapers are also available on the Library of Congress' Chronicling America website, but I like the format the Missouri website has, listing each county and its related newspaper that you can search. Just click on the image above to be taken to the Missouri newspaper site. If you hover your cursor over each newspaper title, you can see the source for the link to see where it will take you. I use Firefox, so that source link appears in the lower left corner of my browser window. You'll see that some of the links go to Chronicling America, but some go to other pages in the Missouri Digital Newspaper Project website--so those sources are not likely to be on Chronicling America. Doing that should help you pinpoint which resources might be those that you haven't looked through before on Chronicling America. There were several I visited on the Missouri site that I hadn't seen before and I was able to find a couple articles that I might not have found otherwise. So if you have some ancestors from Missouri, this newspaper resource might prove helpful to you.